Serve up a new take on Taco Tuesday with a Turkey Taco Bowl! 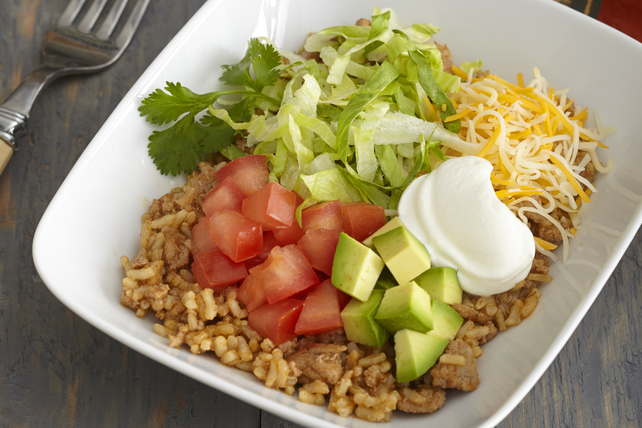 This Turkey Taco Bowl features salsa, brown rice, shredded cheese, avocado, tomato and more. Cook turkey in large deep skillet on medium heat until done, stirring frequently. Add taco seasoning mix, water and salsa verde; mix well. Bring to boil, stirring frequently. Stir in rice; simmer on medium-low heat 5 min., stirring occasionally. Turn off heat. Cover skillet with lid; let stand 5 min. or until rice is tender and liquid is absorbed. Spoon rice mixture into 4 bowls; top with remaining ingredients. Balance out your food choices throughout the day so you can enjoy a serving of this flavourful Turkey Taco Bowl for dinner. Garnish filled bowls with chopped fresh cilantro before serving. Cool any leftover cooked rice mixture, then refrigerate up to 4 days before reheating to serve as directed.